By W. Gardner Selby on Tuesday, May 2nd, 2017 at 4:18 p.m.
Rick Perry says his quotation of Donald Trump's expectations can't be overrun by a PolitiFact fact check. He's right (PHOTO, L.M. Otero, the Associated Press, April 2017). In New York the other day, Rick Perry of Texas underscored a Texas-and-Trump claim by saying it couldn’t be found erroneous by PolitiFact. 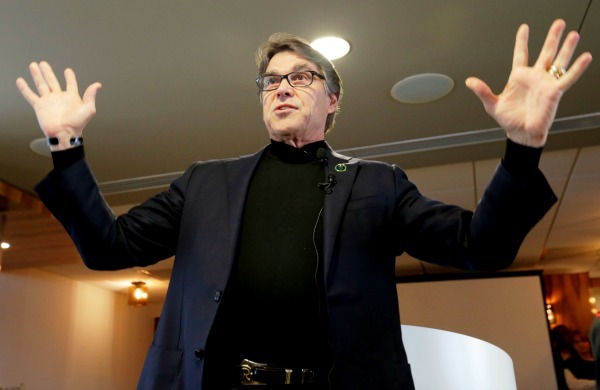 Perry, the former governor newly sworn in as U.S. secretary of energy, said in the April 25, 2017, keynote address at the Future of Energy Global Summit that when President Donald Trump interviewed him for his cabinet job, Trump told him: "I want you to do for American energy what you did for Texas." Perry said in New York: "I saluted that, if you will. And -- I told somebody, I said, ‘He also repeated that on national television not too much later, so I don't have to be PolitiFact,’ and checked on it." That’s right; Trump said at a March event at the headquarters of the Environmental Protection Agency: "I told Rick, I said, run it the way you ran Texas -- because this is going to be a great operation." Perry, who was governor from late 2000 into 2015, faced dozens of PolitiFact Texas fact checks from that project’s inception in 2010--which he evidently noticed. In a January 2015 exit interview with Peggy Fikac of the San Antonio Express-News and Mike Ward of the Houston Chronicle, Perry said that on his watch, Texas had reduced "our nitrogen oxide levels by 63.5 percent." "Say 63 percent," Perry then said, "that way, we won’t get PolitiFacted." Then he laughed. In May 2014, PolitiFact Texas found Half True Perry’s claim that since 2000, Texas had reduced "harmful pollutants in the air like nitrogen oxide by 62.5 percent and ozone by 23 percent — a reduction that is 12 percent greater than the national average." The figures were accurate, but the claim took into account only one NOx source — industrial — which Perry failed to note. Nearly three-quarters of NOx emissions come from other sources. Perry’s declaration also didn’t reflect on the significance of federal oversight. See Perry's full Truth-O-Meter report card here. Trump’s report card is here. See Rick Perry’s Truth-O-Meter report card here.